John Roberts was the 532nd player to appear for Arsenal. A Welsh international he was a more than useful member of the first team squad filling in the role of no-nonsense centre-half. He won a League Championship winners medal for his appearances in the 1970-71 campaign, during the double winning season. Born on 11 September 1946 in Abercynon, Wales, initially a striker John started out at his hometown junior side Abercynon Athletic, while also working as a railway fireman. He found his way to Swansea in July 1964 and moved onto Northampton in November 1967. John Roberts arrived at Highbury on 30 April 1969 for £35,000 and a few weeks later joined the first team on their post-season tour of Malta. His Arsenal first team debut came at the Dell versus Southampton on 2 September 1969 in the League Cup. A squad centre-half he filled in for Peter Simpson or Frank McLintock when required. During the double season he appeared eighteen times in the League from the start of the season as partner with McLintock. However when Peter Simpson was declared fit in November 1970 he was back in the squad and only played once more that season. He did not appear at all in the 70-71 FA cup run, owing to the efficiency and fitness of the Simpson-McLintock axis. And in fact did not appear in a single FA cup tie for the Gunners in his three years at the club! He did however appear in a number of European games but his most influential performance was off the park during the away game at Lazio. He was central to the Gunner’s fisticuffs response to the Lazio players, and it was even said he threw a few Italians over car bonnets during the brawl! His total of league appearances meant he was awarded a Championship winners medal in 1971. Also during the 1970-71 season he won the first of his twenty-two Welsh caps, and later Roberts was part of the Wales squad that reached the quarter-finals of the 1976 European Championship. He continued to appear in defence for the club, making his final appearance on 3 October 1972 in the 5-0 League cup win over Rotherham. Soon afterwards he was sold by Bertie Mee having scored fives times in a total of 81 first team appearances for the club, four of which were as substitute. 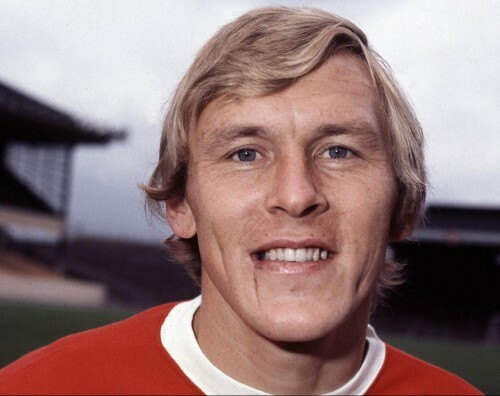 Additionally he made over 60 reserve appearances and won winners medals in 1969-70 for both the Football Combination title and the London FA Challenge cup. He moved for £150,000 to Birmingham on 11 October 1972 and played at St Andrews until July 1976. He then went on to appear over 150 times for Wrexham helping the Dragons to win the Third Division and the Welsh Cup. He joined Hull in August 1980 before finishing his professional football career in 1982. John was then player-manager of Oswestry Town for a season before becoming a driving instructor in Chester. He returned to London with his wife and ran his own property maintenance company. His son is a fitness expert whose clients have reportedly included the Prime Minster, David Cameron. Don’t forget to subscribe to the blog (top right).